Read the instructions below and then post your response to the Moodle forum. If you have time, respond to your peers and begin a conversation about Whitman and how his poetic device of cataloging can help us become better readers and interpreters of American Literature. For today’s Digital Humanities Lab, your job is to explore this “e pluribus unum” work of “Song of Myself” and think about the mechanisms of continuity, unity, fluidity in Whitman’s manuscripts alongside the discontinuities, deletions, substitutions and redirections that run through the surviving drafts of his poem. 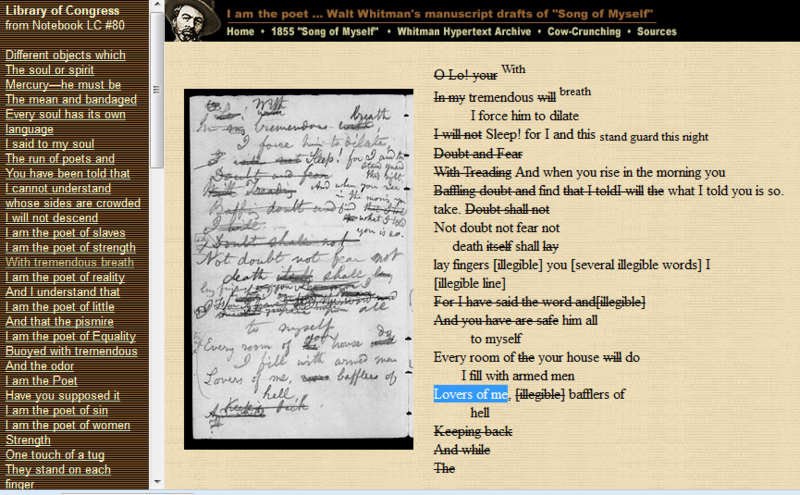 Go to the Whitman Archive page “Whitman Manuscript Drafts of Song of Myself” (1855) here. Read what author Ed Folsom says about the collection of manuscript drafts of the poem. 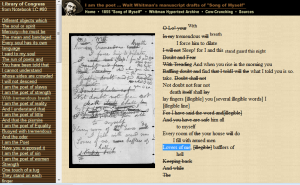 Next, open a second tab and go to one completed version of “Song of Myself” online (this one from University of Illinois’s Modern American Poetry site–a really useful one to bookmark). Click on the DIGITAL HUMANITIES LAB RESPONSE link in Moodle to post your responses. EVERYONE ANSWER THIS QUESTION: A question of composition: What scraps and patches of poetic drafting eventually find themselves in Whitman’s final poem? What does this collection of digitized manuscript fragments—and their subsequent scattering in four archives—tell you about the composing process? A question of formal devices: The poetic device of cataloging that Whitman uses here and throughout his ouevre provides a dynamic model of inclusiveness, as if the goal of his poetry is to collect everything under a single “roof” of poetry. What are the advantages of this device? What are its limitations? A question of poetic nation-building: What aspects of Whitman’s fragments and final poem “Song of Myself” situate the poet and poem in larger themes of American literature and culture—the sense of a “boundless dream” and hunger for new beginnings? A question of comparison: For those of you familiar also with Emily Dickinson: compare Whitman’s sprawling freedom with Dickinson’s tightly bound intensity and talk about how they are both somehow “American” by talking about the emerging national literary characteristics or persistent themes, tone, concerns, focus etc. Which of the scraps (“the cocktail napkin drafts”) in this collection are most interesting to you and why? If you’re interested in the printing/publishing aspect of literary enterprise, you may want to read the entire article by Ed Folsom, University of Iowa. What does he say about the value of the “HRC manuscript” to literary scholars and why? Think about your own writing and thinking and revising process. What is the significance of this collection of fragments to you?